First discovered in 1857 along Australia’s Queensland coast, macadamias were named in honor of Dr. John Macadam, a colleague of the Australian botanist who made the actual discovery. Australia is the leading producer of macadamia nuts (the only native Australian plant to be developed as a commercial food crop). “Macs” are also grown in large quantities in Hawaii, South Africa, Costa Rica and Guatemala. Production has been notably increasing in South Africa and the country has made great strides in the international macadamia market. As Red River continuously looks for ways to become involved in corporate social responsibility programs around the world, we look forward to expanding our suppliers’ existing programs as well as working together to begin new ones. In the U.S., macadamia nuts are used in confectionery and snack items. Macs offer a rich, sweet flavor. They are a good source of Vitamin A, iron, protein, thiamin, riboflavin, niacin, and folates, and contain moderate amounts of additional vital minerals. 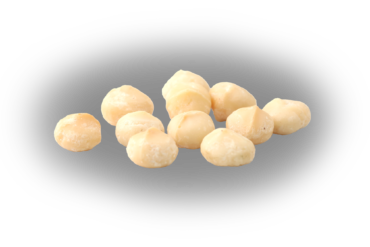 Macadamias contain antioxidants like polyphenols, amino acids, flavones, and selenium.